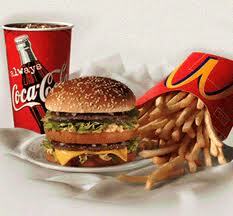 Grab a Big Mac, large fries, and Coke as you exit a hospital after a heart attack scare? After all, you're exhausted and in a hurry, detest bland hospital fare... and what the heck, you deserve a break today, to use McDonald's famed slogan. Fantasy, right? The same medical professionals who bother you mercilessly about your all-American taste-buds wouldn't dare plop forbidden (but ferociously profitable) fast-food on hospital premises, right? Believe it or not, wrong. 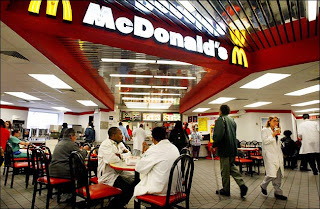 Twenty-two U.S. hospitals and medical centers... including the esteemed Cleveland Clinic in Ohio, the Naval Medical Center in San Diego, and Texas Children's Hospital in Houston... permit full-service McDonald's stores on hospital premises. The respected Physicians Committee for Responsible Medicine is appalled and angry, and has joined forces with Corporate Accountability International to demand that these supposed guardians of public health "end your contract with McDonald’s and to take action to remove the McDonald’s restaurant from your hospital." "According to the Centers for Disease Control and Prevention, in the decades to come, one in three children will develop type 2 diabetes as a result of diets high in McDonald’s-style junk food... Every day, parents, children, and health professionals turn to your institution for advice on well-being, for support in preventing and treating illness, and for sustaining a healthy community. As a hospital, you serve as a local authority on health, and as such, the community you serve looks to you and to your environment as a guide for their well being. "However, in your role as a local health leader, you have allowed McDonald’s—a corporation that has disregarded public health in the name of profits—to operate within an environment devoted to helping our children get well." Hospitals likely earn a percentage of sales generated by the McDonald's outlets, which could be a rich revenue source, given how popular burgers, fries, soft drinks and the like are with Americans. Unlike smaller food franchises, McDonald's can easily afford to absorb all construction costs for a new outlet in a lucrative location, such as a well-traveled hospital. McDonald's or its executives may be important hospital donors. Certainly, their Ronald McDonald Houses are much sought-after adjuncts for medical centers across the nation. "That's nutritional progress. But a Big Mac with medium fries still gives you more sodium than you should have in an entire day of eating (plus 880 calories, over half of which come from fat). A single Egg McMuffin gives you three-fourths of your daily sodium allotment and 290 calories, a third of which come from fat. McDonald's prides itself on its special lettuce, which is picked a week early for better taste, but it also prides itself on an innovative packaging system that gives chopped lettuce a 10-day shelf life. A restaurant with health as a top priority would not serve 10-day old lettuce, much less lettuce grown with pesticides..."
I agree with Physicians Committee for Responsible Medicine and Corporate Accountability International that it's no surprise that McDonald's wants their stores in hospitals. "After all, for decades, McDonald’s has attempted to co-opt the health community, to deflect blame for the epidemic of disease that it has helped drive, and to pose itself as part of the solution," reads their joint letter. But hospitals and medical centers can obviously do better. U.S. medical institutions are profit-strapped corporations facing profound business changes in their industry, but when they stray from their roles as public health leaders for the sake of profits... well, who needs them? Maybe that's the time we radically rethink health care services delivery. Vanderbilt University Medical Center in Nashville TN boasted an on-site McDonald's for many years.It closed early in 2011. My eldest son (18yo) is autistic and non-verbal. Years ago I would take him to the doctor at the Vanderbilt Child Development Center, I would take him to McDonald's after the requisite blood samples were drawn (needed to monitor the levels of his meds), for some chicken nuggets. Some McDonald's stores had a "picture menu", a laminated sheet with pictures of all the menu items, for use by customers who either cannot speak or speak no English and it would make sense that the Vandy McDonald's would have one, but it did not. Now, when I take him to Vandy for his blood work, he has to settle for ice cream from Ben and Jerry's. Best Book Ever about Fast Food!